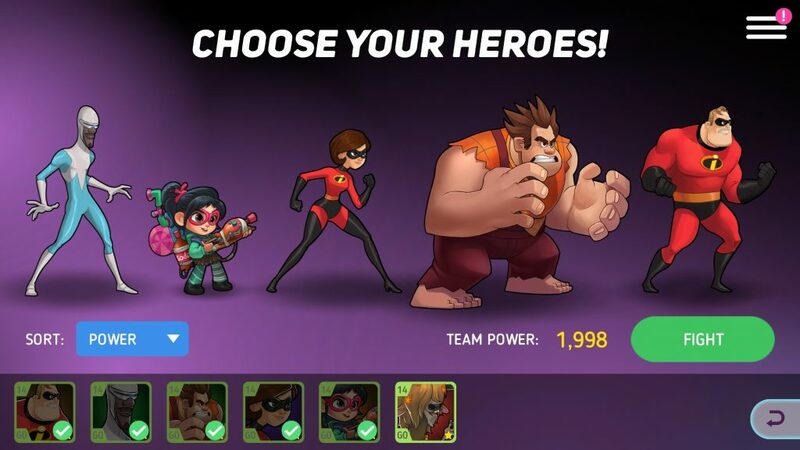 Disney Heroes: Battle Mode is the 1st mobile game published under the new partnership of Disney and PerBlue Entertainment. 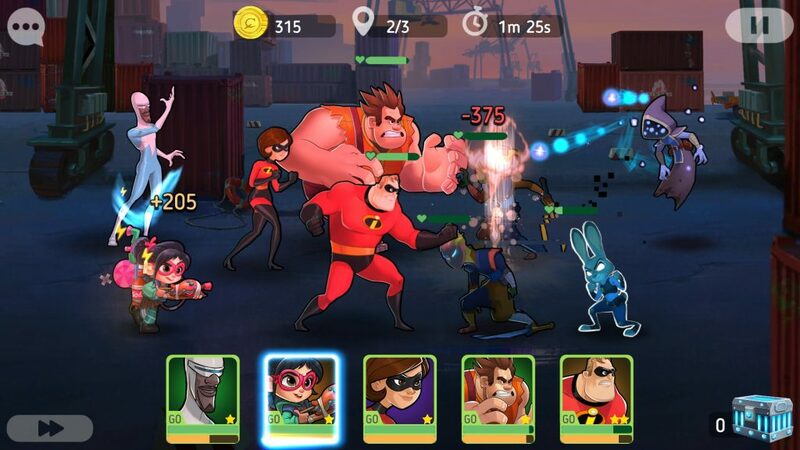 It’s an incredibly fun 5-on-5 team battle and RPG game, starring a bunch of your favorite Disney and Pixar characters. A mysterious virus has infected the game world, creating glitching, evil versions of each character. 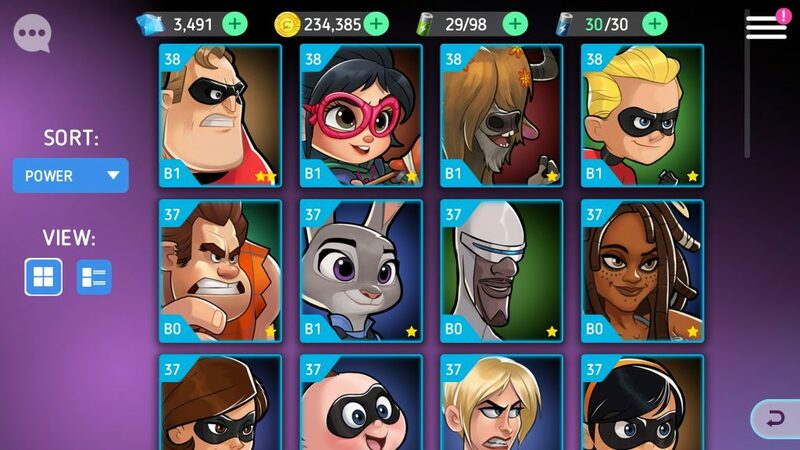 Starting with just Ralph and Vanelope, you’ll need to form an increasingly powerful squad of Heroes in order to fight back this virus and clear it from all areas of the game world. 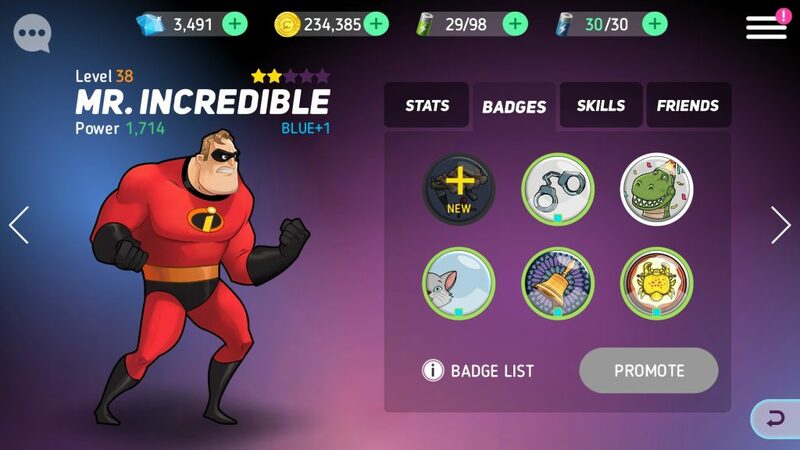 Collect and level up characters, earn and upgrade badges, compete against other players, and have a super time doing all of it, likely for many hours and hours. There are currently 30 Heroes to collect, and more will be added as the game gets updated. There’s characters from Wreck-It Ralph, The Incredibles, Monsters Inc, and Zootopia, just to name a few. You unlock new characters either by rescuing them from the virus, as a normal part of the story progress, or by collecting Character Tokens. These Tokens are awarded by completing battles, opening Reward Crates, or purchasing them in the Market for various types of in-game currency. Once you have a character, you’ll need to make them stronger, so they can beat bigger and better enemies. You can level them up with XP, assign Skill Points to their special abilities, and equip Badges with various bonuses, like extra HP or a higher attack strength. 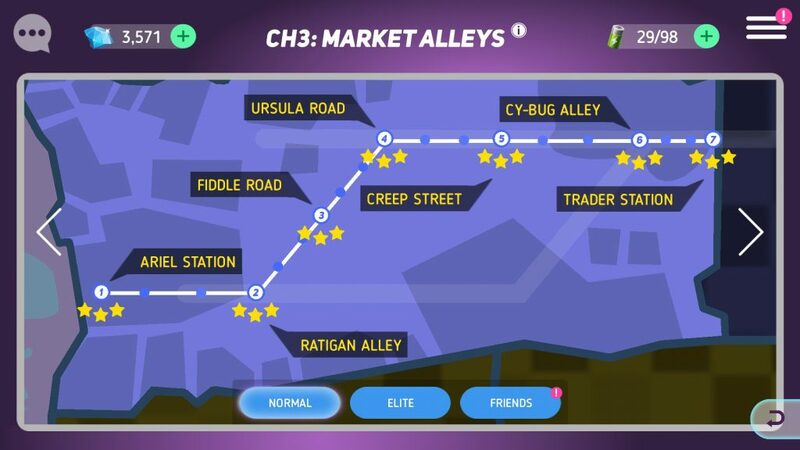 When you first start playing, you’ll have access to the regular Campaign battles, which follow the main story line of the game. 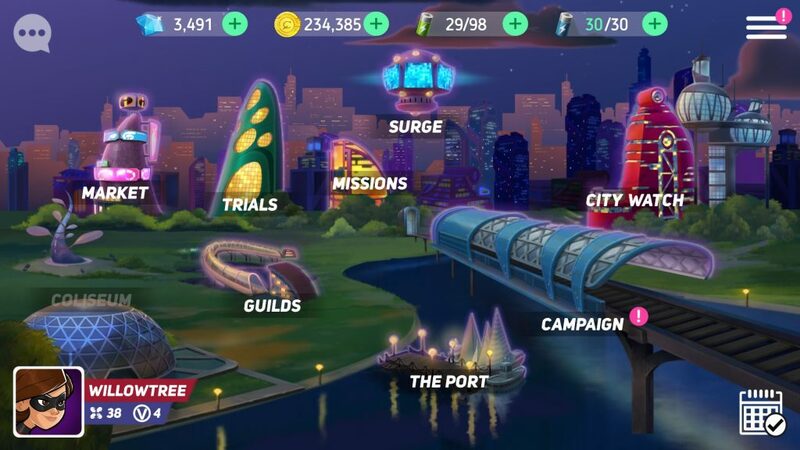 Once you level up your team a little, you’ll unlock other areas, like the Arena, where you get to pit your team against those of other real-life players, and the Surge, Trials, and City Watch areas, which are standard style battles but with extra special rewards for winning. The rewards you can get from these various areas are XP boosts, Gold, Badges, Character Tokens, and a few other items specific to later levels of game play. During any battle mode, the game play is basically the same. You choose the Heroes you wish to send in, and you launch the battle. The Heroes automatically start fighting, and all you need to do is watch the mayhem, and keep your eyes on their Skill Meters. As they fight, these Skill Meters will fill, and when filled, the character icon will glow. Tap on it to launch a Hero’s extra special attack, and deal lots of damage to your opponents. When you reach a higher level, you can even set this special attack action to Auto, so you can just sit back, relax, and watch the battle unfold. Every day, you’ll have a set of Quests to complete, and Medals to collect, which will earn you various rewards, and help you level up faster. Periodically, there will be special Events to participate in, to earn more bonus rewards. Join a Guild to team up with other players, giving you access to even more content and rewards. Sign in every day for a bonus, and make sure to open all of your free Crates each day. You can become a VIP player, and unlock incredible rewards for each VIP level you reach. You can do this by making in-game purchases with real-life money, or by completing special tasks and Offers. The Offers level you up more slowly in the VIP ranks, but many of them are free to complete, and usually just require you to download and play another game app. There’s so much to discover and have fun with in this game, and the best way to discover it all is to play for yourself. I have to admit that I’m a little obsessed with this game. There’s only a handful of games I review that I keep playing after I’ve gathered enough intel for a write-up. There’s only so much room on my phone, after all. This title is staying, though, and if the last couple weeks are any indication, I’ll be spending time every single day with my ever-growing squad of Heroes. Treat yourself to a quality download, and jump on into Disney Heroes: Battle Mode, for Android or iOS. When you level up enough to unlock Guilds, track mine down and join Walts Warriors if you want. I just created it, and I’d love to have you on my team.